Single Parents Mingle focuses on helping single adults meet, rather than on blending families. All the same, it remains clear what kind of person you’ll be meeting right from the start. It’s open to both single parents and anyone with no qualms about finding love with someone not flying completely solo through life. Either way, this site might be just right for your specific needs. The profile process on SingleParentsMingle.com allows you to fill out a number of different questionnaires and personal essays. You can reveal as much as you want about yourself and learn more about others this way. You can also take an online personality test that color codes your profile based on the results. Having taken the test myself, I have to say that it seems more accurate than others I’ve tried. You can skip large portions of the profile questions. There used to be an issue with the system automatically filling in default answers for fields left blank, but that no longer happens. Still, I’m a firm believer that folks who are serious about meeting for a meaningful connection with someone else will take the time to make sure that their profile is as complete and accurate as possible if they want to be successful. Free searches allow you to narrow results to within 10 miles of home. A keyword search option was added a while back and that’s something I found lacking in my initial visit. You can also select all the criteria that are available to fill out on a profile, whether mandatory or optional. 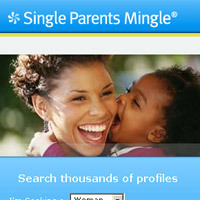 You can even search how many days it’s been since other members have signed onto Single Parents Mingle. The results include last login date and full profile details. You can click on yes, no or maybe to instantly show whether someone interests you or not. Besides informing your “yeses” of your interest, it’ll also remove the “no” responses from future results. You can also send free signs of interest to any subscriber and read the message boards. There are chat rooms, instant messaging and onsite email, but they’re limited to paid subscribers. It’s unfortunate that nonpaying members can’t read emails from other paying members. The site still struggles to attract visitors compared to how it did at the height of its popularity. It has lowered its price again, although I did notice some advertising added to the homepage. All the same, with kids at home, money can be tight, so saving money is always a good thing. Single Parents Mingle is so inexpensive that even though you have to pay to reply to messages, it’s not going to cost much to give it a try.